When you sign up for Favro, you immediately benefit from all of our paid features. At any point during your trial you can upgrade to a paid plan by clicking Upgrade now. You can now choose your preferred plan and payment frequency. Remember that you save 15% if you go annual! 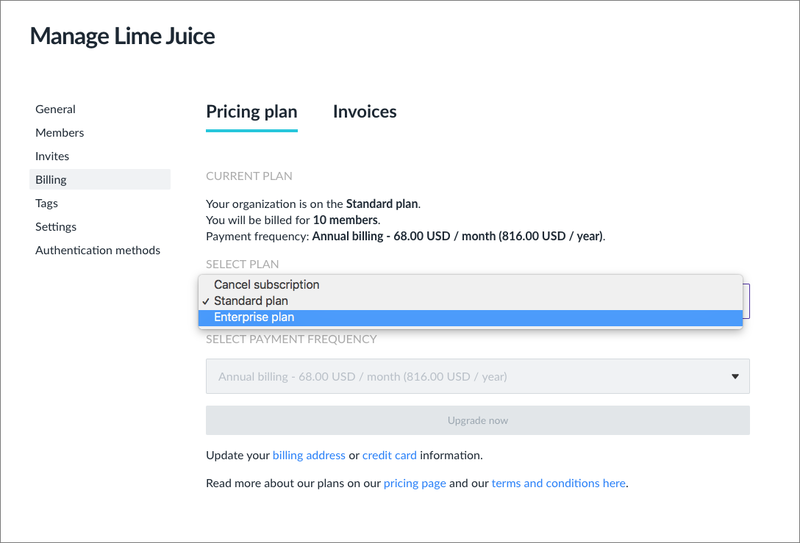 If you have any questions about the pricing, you can contact us right from the upgrade dialog, or you can read more on our pricing page. If you are already paying for the Standard plan and want to upgrade to Enterprise, you can go to the Profile menu > Administration > Billing and change plan. When adding enough users to your organization that you change plan size, you will be prorated the difference for the remainder of the payment period. So, as an example: if you are on the 5 user plan and add your sixth member with one week to go on your payment period, you will be charged for the additional five users to reach the 10 user plan for the remaining week. Next payment period, you will be charged for 10 users the whole month or year depending on plan. When removing users, leading to a downgrade of plan, you are given a credit for the time left on that payment period. This credit is then used when upgrading again or during your next renewal before charging any additional costs. If you need to find your receipts/invoices for bookkeeping purposes. You can download these right from within the tool. By going to Administration > Billing > Invoices you can view all your invoices and print or download these. We do offer organizations to pay by invoice but to be viable for invoicing, you must pay for an annual subscription of the Enterprise plan for a minumum of 100 users. If you are interested in paying by invoice, and you fill the above criteria, please reach out to us on customersuccess@favro.com or open a chat with us right from this article!